In my quest for healthier eating, I'm becoming a fan of lentils. Here's a tasty recipe I found in the newspaper a while back. I love the tangy flavor that comes from the vinegar and honey in the dressing! Place lentils in a saucepan; add water to come 2” over lentils. Partially cover and bring to a boil over medium-high heat, then reduce the heat so the water is barely boiling at the edges. Cook for 20-25 minutes, until the lentils are just tender. Drain the lentils and transfer them to a large bowl. This is what the lentils look like after cooking. Meanwhile, heat half the oil (2 Tablespoons) in a medium skillet over medium–high heat. (I wanted to cut calories, so instead of using the oil I sprayed the pan with a small amount and it turned out fine.) Add the onion and a pinch of salt, stirring to coat; reduce heat and cook about 4 minutes, until onion has softened. Stir in the apples; cook for 3-4 minutes until just softened. Add ham and stir in. Cook 3-4 minutes or until ham is heated through. Add to the drained lentils. I used two cups of ham here; the recipe only called for one. Whisk together the remaining 2 Tablespoons of oil, the vinegar, mustard and honey to form a dressing. Season with salt & pepper to taste. Pour over the lentil mixture, then add the parsley. Toss gently to incorporate and coat well. Serve warm or at room temperature. 8 servings – makes 5½ cups. Nutrition per serving when made according to recipe: 190 calories, 9 g protein, 21 g carbs, 7 g fat, 5 mg cholesterol, 160 mg sodium, 8 g fiber, 5 g sugar. Dropping by from the Thrifty Things Friday Party! This looks like a healthy and tasty recipe! Thanks for sharing it at TTF! 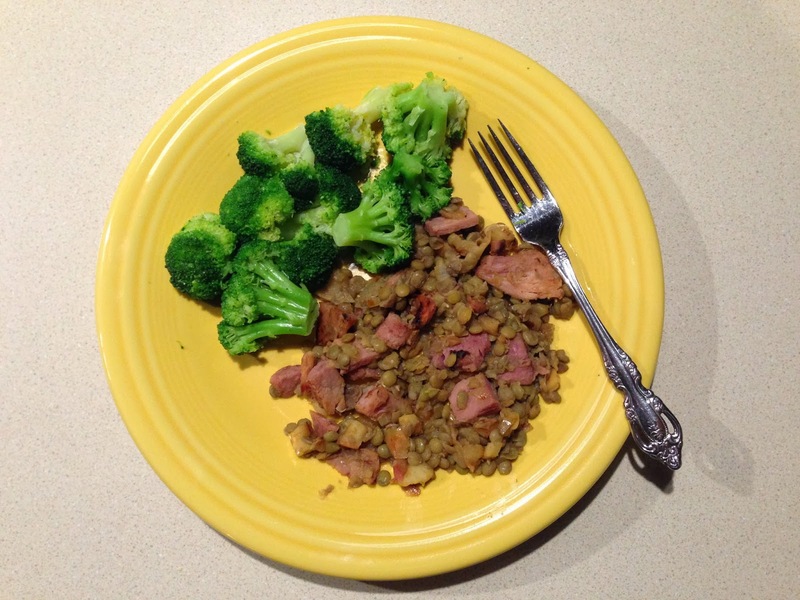 I'm a lentil fan and will try this recipe! It sounds yummy. Thanks for sharing with us at The HomeAcre Hop! What an interesting combination! - sound delicious. Thanks for sharing with us on the Wake Up Wednesday blog hop.